Today is the feast day of the Archangels Saints Michael, Gabriel, and Raphael. 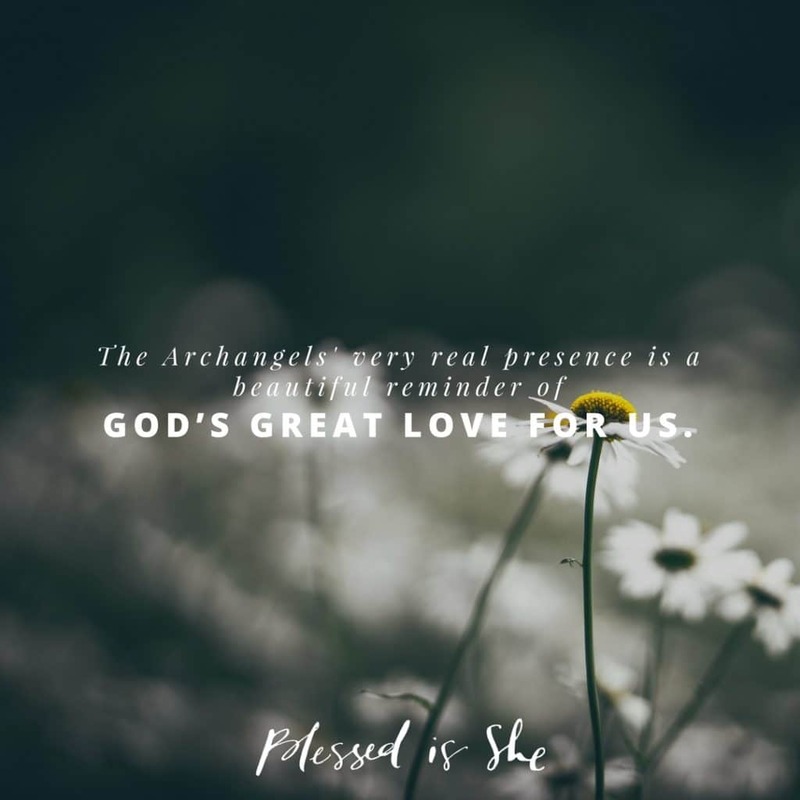 Their very real presence is a beautiful reminder of God’s great love for us. I never heard much about angels in my home growing up, but I had a sort-of-hippy aunt who loved the idea of angels. The angels she spoke of were like fairies from the stories—sweet and loving and gentle. They were guardians and protectors. Exactly what we were being protected from was never mentioned. When I joined the Church as an adult, I wasn’t even sure if Angels were legit. Of course there are hundreds of scriptural references to Angels, but I still had a very one-dimensional non-academic view of the celestial beings. My idea of Angels lacked any context or awareness of their purpose or of the spiritual battles they fight around us. Good angels (as opposed to the fallen angels) are part of the Mystical Body of Christ, and as such are fellow members of the Church. As Catholics, we don’t worship the Angels. We venerate or honor the Angels along with the Saints, and join them as together we worship God. Angels surround the heavenly throne, but they also are present here on earth. We each have a Guardian Angel whose main task is to help us to get into Heaven; there are Angels who have authority over nature, and Angels for each church, city, and nation. These messengers of God are pure spiritual beings, individual in person, who have immortal souls like ours. When my children get lonely or scared I remind them that they have their Guardian Angel with them at all times. As comforting as Angels are to the little ones, they should be equally comforting to us; they even ministered to Christ in the Garden of Gethsemane. They act unseen around us, guiding and guarding our path to Heaven. No matter how old we grow, we will never out grow the need for our Angels. How can you celebrate the Archangels on their feast day today? Say a special prayer or reach out anonymously and help someone in need. Previous Post Let Me Just . . .